Got God? Home F.A.Q READ!! Puppies Parent Dogs Retired Dogs TRAINING (purchase) Ours VS Others Male Vs Female Pregnant now Litters Planned SHIPPING RULES!! NuVet Puppy Food & Treats Price List: Puppy Picture Day Contact Payment Colors Coats and low shed "Toys"
"Floating Deposit" or better known as a "GENERAL WAIT LIST" is a term that we are begining to use lately. It is similar to a normal deposit except that it isn't "set" on a speciffic litter. I simply collect deposits and they are not gender based. If any of my "full" litters have more than 4 puppies, (which they typically always do) the first person in line for the floating deposit will get first option to "land" on that litter. You will be notified by email as soon as puppies arrive and will need to respond to me within a short period of time (typically a couple hours after momma is done delivering) as to wether you want to be on that litter or pass to the next. If I don't hear from you, in the short period of time, I consider that as a pass. A Floating deposit is a good choice if you just simply want a puppy and are not overly particular about who the parents are. 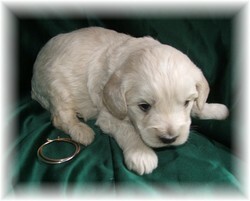 OR if you are just wanting to be on our list for our next available puppy. This is helpful as even the normal deposit list (speciffic litter) is not guaranteed to produce the exact puppy you want and in that case your deposit will need to be transferred. These are for speciffic litters are gender based and can be transferred at any time to any available puppy. A "REGULAR DEPOSIT" takes priority over all floating deposits. Mommas typically have between 5-10 puppies with 6-8 being average litter size. ;o) We almost always have more puppies than deposits so floating deposits are not altogether a lost cause. However, I only accept 2 gender based deposits per litter because we don't always get the genders that we are hoping for in each speciffic litter. Hope this makes sense? CONFIRMED MATING MEANS = Mating was witnessed and we have a due date. THIS DOES NOT GUARANTEE THAT CONCEPTION TOOK PLACE (although it typically does) OR THAT THE FEMALE WILL BE A GOOD MOMMY! PROJECTED DUE DATE MEANS = No mating was witnessed but female was in with correct male during her heat cycle. REGULAR DEPOSIT MEANS = Deposit is placed directly on a specific litter with a 75% or greater chance of getting a puppy from that litter. FLOATING DEPOSIT MEANS = You will be placed on an overflow list. After all of the regular deposits for a particular litter are filled, there are often 1-4 puppies left over. That is when we turn to our "floating" deposits. DEPOSIT MEANS = You are making a NON REFUNDABLE reservation on one of our puppies. All deposits are transferable to other litters and even to other friends and family members. Please be sure before placing a deposit because it makes no difference if it is 5 minutes or 5 months ago that you placed it. DEPOSITS ARE NON REFUNDABLE. No other litters (besides what is posted) planned at this time until late summer/early fall. We might have a litter between Miya and Jake coming and we will likely breed Pearl to Jake if she comes into season soon.